Mitred conure on a cherry blossom tree in Seward Park. 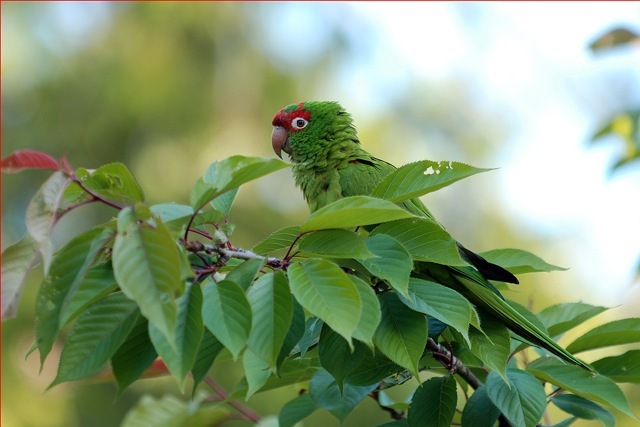 Mitred Conures, or green parrots, are native to the Andes in South America, but every spring a flock shows up in Seward Park. Joey Manson, the Operations Manager at Seward Park Audubon Center, said no one on staff is clear on the birds’ history, but there is a theory that the parrots are released or escaped house pets from Ballard. 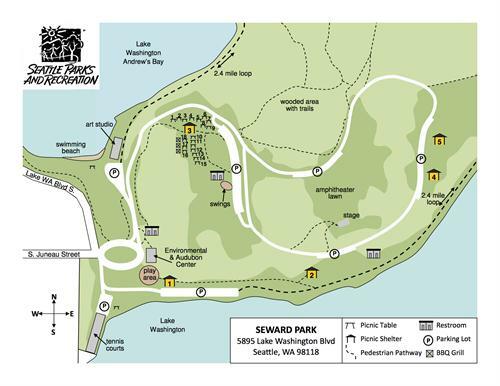 Friends of Seward Park Board President Paul Talbert said people have claimed to see the birds in the park since the 1970s. He said the flock has ranged from a high of 16 members to a low of three. This year’s number hasn’t been determined, but Manson said people have been hearing the birds chattering overhead for a few weeks. In earlier years, the flock used to spend its winters in the Maple Leaf neighborhood, but hasn’t been spotted there recently. The parrots had a nest in a hole in a Douglas fir near one of the picnic shelters, but Talbert said the nest was taken over by bees. Local residents have reported that the birds frequently raid their growing sunflowers and bird feeders. If you want to catch a glimpse of the parrots, Talbert said sightings are most likely to occur around picnic shelter #3 or near flowering trees, and the best way to find the parrots is to listen: although the birds fly high, they are very loud. To update this story we are happy to report several sightings of the Seward Park parrots during the course of this past winter. They have been confirmed in Shoreline's Ridgecrest neighborhood, just north of Seattle, as well as Seattle's Laurelhurst neighborhood within the past couple of weeks. With Seattle experiencing an early spring we can expect their return to Seward Park in the not too distant future.